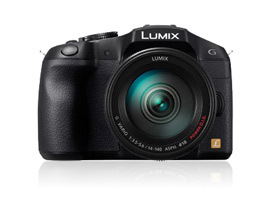 Panasonic’s mid-range DMC-G6 features a 16-Mpix sensor with a new Venus Engine image processor accounting for an extended sensitivity ranging from ISO 160 to 25,600 (up from ISO 12,800 on the previous DMC-G5 model) and rapid continuous shooting mode of up to 7fps (with AF-tracking at 5fps). Although the EVF remains the same resolution at 1.44 million dot the DMC-G6 adopts a new ultra-responsive OLED variant with proximity sensor and a 3.0-inch, 1.04 million dot,articulated capacitive touch screen at the rear. New features include a gesture-based “Clear Retouch” function – a context aware cloning tool allowing retouching during playback, and like the earlier entry-level DMC-GF6, it also has built-in Wi-Fi with the practicality of NFC (Near Field Communication) technology for simplified connectivity with compatible smart-phones and tablets. Panasonic has also enhanced the HD movie capabilities. As well as useful 3.5mm mic-socket, the DMC-G6 adds 24p in AVCHD with 1080 60/30p (50/25p PAL) as either MP4 or AVCHD format. Let’s see how well the DMC-G6 performs against rival mirrorless offerings. 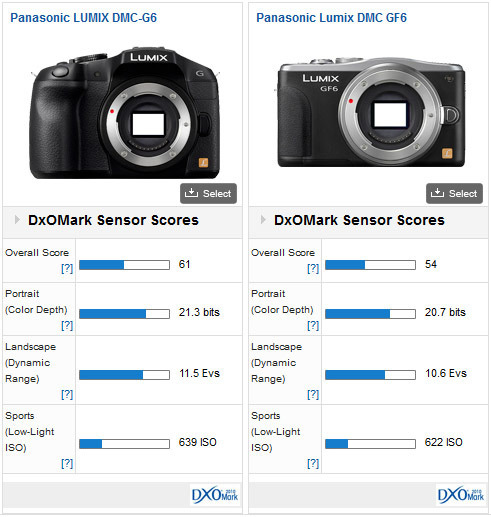 With an overall DxOMark Sensor Score of 61 points, the MFT format Live MOS sensor of the Lumix DMC-G6 performs well in general terms, but it not at the bleeding edge of MFT sensor technology or image performance. 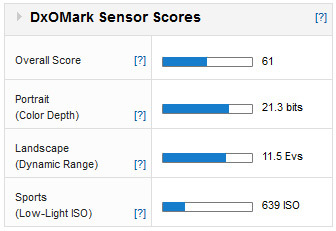 The individual metric scores, for instance, are competitive with the physically smaller CX-format sensor in the 14-Mpix Nikon 1 V2 with +2/3 stop advantage for Low-Light and DR and around +1 stop advantage in Color Depth, but that’s not exactly comparing like-for-like sensors. Comparing it to both similar size and larger APS-C 16-Mpix sensors from rival makers, the sensor in Lumix DMC-G6 is someway behind in outright performance terms. 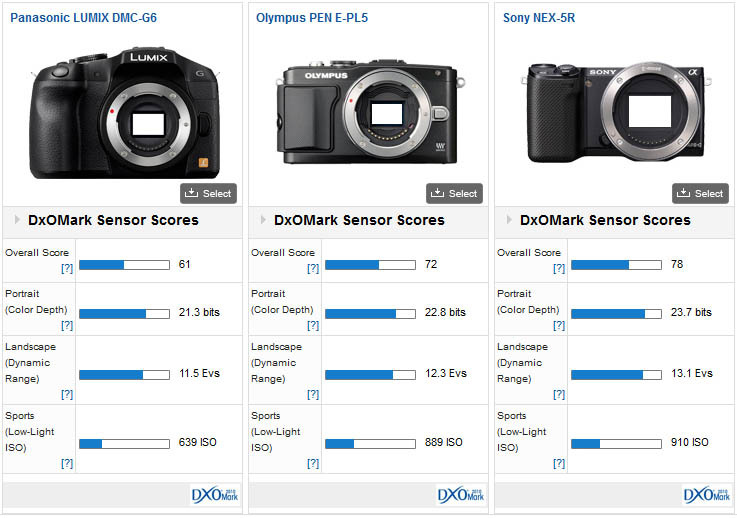 Against the competitively priced Olympus PEN E-PL5 (which adopts a similar sensor as the firm’s regarded OM-D EM-5) and the Sony NEX-5R, the Lumix is between -2/3 to -1 stop behind in each category. 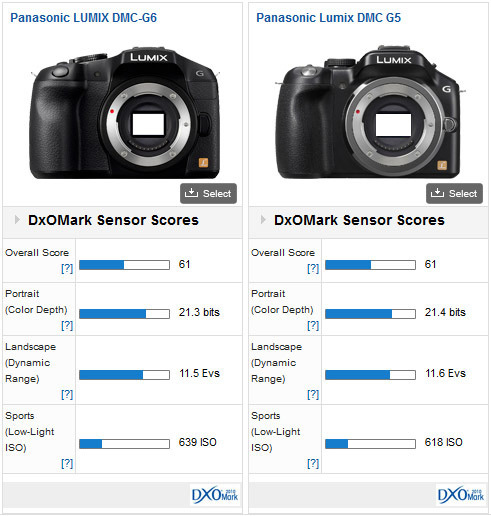 Compared to the firm’s previous iteration with identical DxOMark Sensor Scores (and negligible differences between the individual metrics), it’s safe to say the two adopt the same sensor. Compared to the recent finder-less DMC-GF6 from the firm the newer, pricier model shows some improvements, though there’s nothing in it between Low-Light ISO performance. Although the sensor is clearly an older unit (used originally in the superb DMC-GH2 and then the DMC-G5) and is beginning to look dated against more modern designs used by rivals, there’s still a lot to like about the video capabilities and the camera’s features. It’s a thoroughly likeable model but Panasonic need to adopt a new, more able sensor if it’s to compete more closely with Olympus and Sony for the not-inconsiderable stills market.